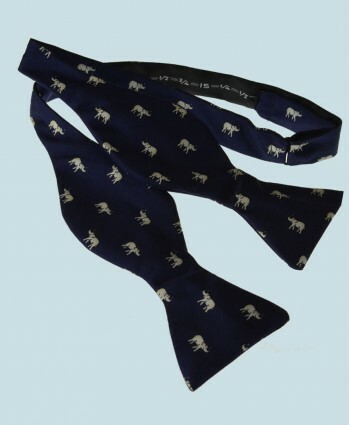 This classic silk self-tie bow tie features a neat pattern of white elephants with lucky raised trunks on a navy background.The self tie bow tie is made of finest quality Italian printed silk.All Fort and Stone bow ties come with adjustable neck bands to fit neck sizes 14 to 18".Bow size is approx: 2.5" high x 4.5" wide (6cm x 11cm).Dry Clean OnlyA donation of 10% of the purchase price of this fin.. 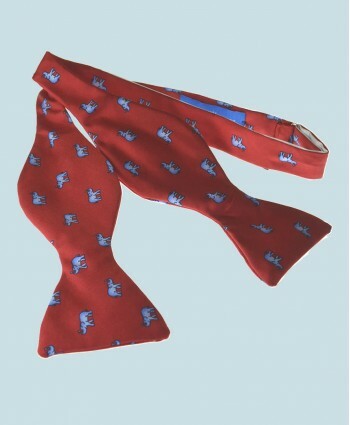 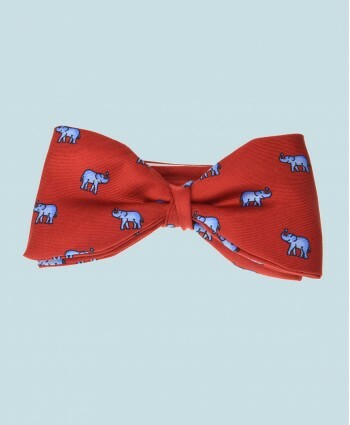 This classic silk self-tie bow tie features a neat pattern of light blue elephants with lucky raised trunks on a bright red background.The self tie bow tie is made of finest quality Italian printed silk.All Fort and Stone bow ties come with adjustable neck bands to fit neck sizes 14 to 18".Bow size is approx: 2.5" high x 4.5" wide (6cm x 11cm).Dry Clean OnlyA donation of 10% of the purchase price .. 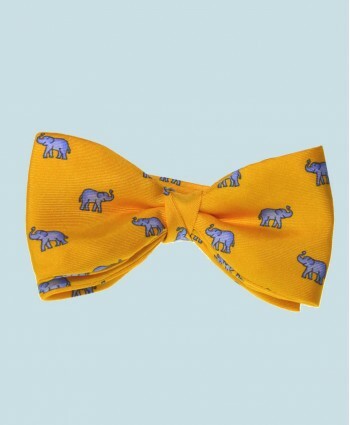 This classic silk self-tie bow tie features a neat pattern of sunflower yellow elephants with lucky raised trunks on a light blue background.The self tie bow tie is made of finest quality Italian printed silk.All Fort and Stone bow ties come with adjustable neck bands to fit neck sizes 14 to 18".Bow size is approx: 2.5" high x 4.5" wide (6cm x 11cm).Dry Clean OnlyA donation of 10% of the purchase .. 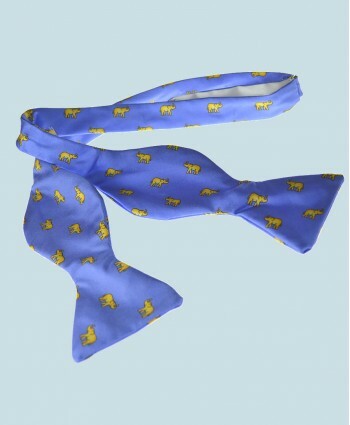 This classic silk self-tie bow tie features a neat pattern of light blue elephants with lucky raised trunks on a sunflower yellow background.The self tie bow tie is made of finest quality Italian printed silk.All Fort and Stone bow ties come with adjustable neck bands to fit neck sizes 14 to 18".Bow size is approx: 2.5" high x 4.5" wide (6cm x 11cm).Dry Clean OnlyA donation of 10% of the purchase .. 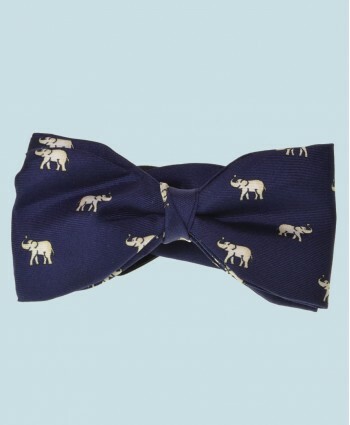 This classic silk ready-tie bow tie features a neat pattern of white elephants with lucky raised trunks on a navy background.The ready tie bow tie is made of finest quality Italian printed silk.All Fort and Stone bow ties come with adjustable neck bands to fit neck sizes 14 to 18".Bow size is approx: 2.5" high x 4.5" wide (6cm x 11cm).Dry Clean OnlyA donation of 10% of the purchase price of this f.. 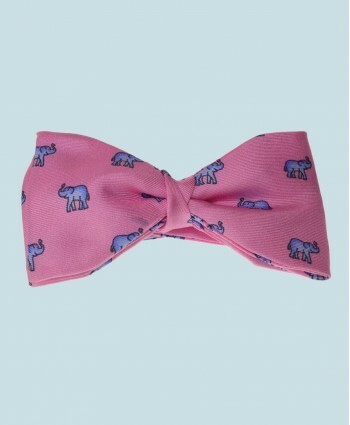 This classic silk ready-tie bow tie features a neat pattern of rose pink elephants with lucky raised trunks on a light blue background.The ready tie bow tie is made of finest quality Italian printed silk.All Fort and Stone bow ties come with adjustable neck bands to fit neck sizes 14 to 18".Bow size is approx: 2.5" high x 4.5" wide (6cm x 11cm).Dry Clean OnlyA donation of 10% of the purchase price.. 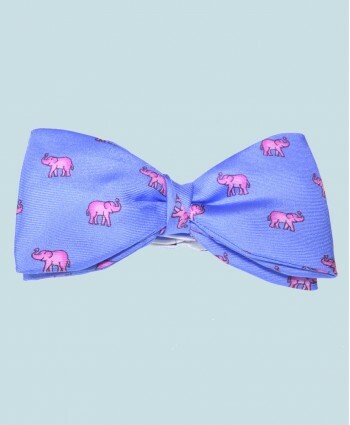 This classic silk ready-tie bow tie features a neat pattern of rose pink elephants with lucky raised trunks on a light blue background.The ready tie bow tie is made of finest quality Italian printed silk.All Fort and Stone bow ties come with adjustable neck bands to fit neck sizes 14 to 18".Bow size is approx: 2.5" high x 4.5" wide (6cm x 11cm).Dry Clean OnlyA donation of 10% of the purc.. 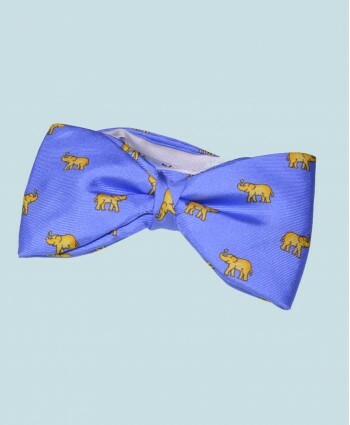 This classic silk ready-tie bow tie features a neat pattern of sunflower yellow elephants with lucky raised trunks on a light blue background.The ready tie bow tie is made of finest quality Italian printed silk.All Fort and Stone bow ties come with adjustable neck bands to fit neck sizes 14 to 18".Bow size is approx: 2.5" high x 4.5" wide (6cm x 11cm).Dry Clean OnlyA donation of 10% of the purchas.. 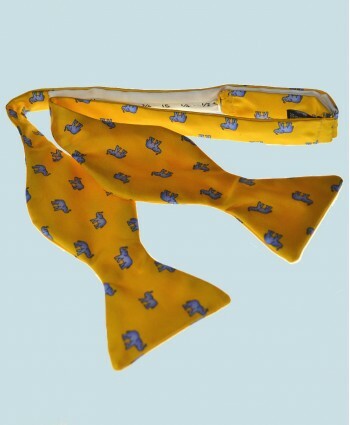 This classic silk ready-tie bow tie features a neat pattern of light blue elephants with lucky raised trunks on a sunflower yellow background.The ready tie bow tie is made of finest quality Italian printed silk.All Fort and Stone bow ties come with adjustable neck bands to fit neck sizes 14 to 18".Bow size is approx: 2.5" high x 4.5" wide (6cm x 11cm).Dry Clean OnlyA donation of 10% of the purchas..